[Stokes Patent Engraving Machine]. 1851? [Stokes Patent Engraving Machine]. [London? ], [1851?]. Engraving(?) with ink and gouache drawing, sheet: 14-3/8 x 8-3/8; inscribed in pencil verso, “Anaglyptograph / 1851 Exhibition / JS Harrison Son,” with typed caption mounted to top edge of leaf reading “Inscribed at back ‘Anaglytograph [sic]. 1851 Exhibition. T.S. 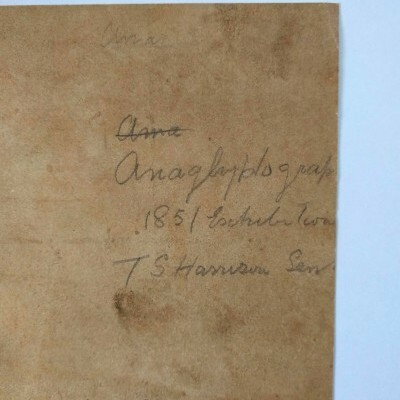 Harrison Snr.’” Sheet creased where folded, v. light staining and rubbing, right edge nicked. With so much scholarship about 19th-century reproductive technologies and the relationship between science and art, the possibility of a machine that converted sculpture to data would neatly prefigure the 21st-century 3D digital scan. 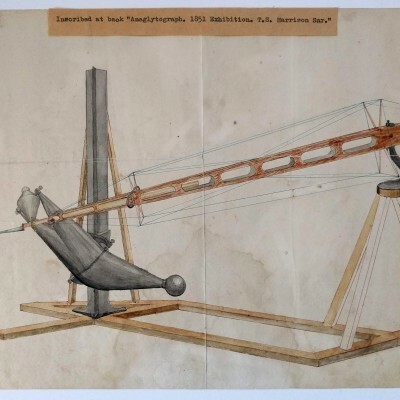 And indeed, Samuel Stokes of Monkwell Street was granted a patent “for engraving from solid bodies” in 1847; his device was called Stoke’s Patent Engraving Machine. 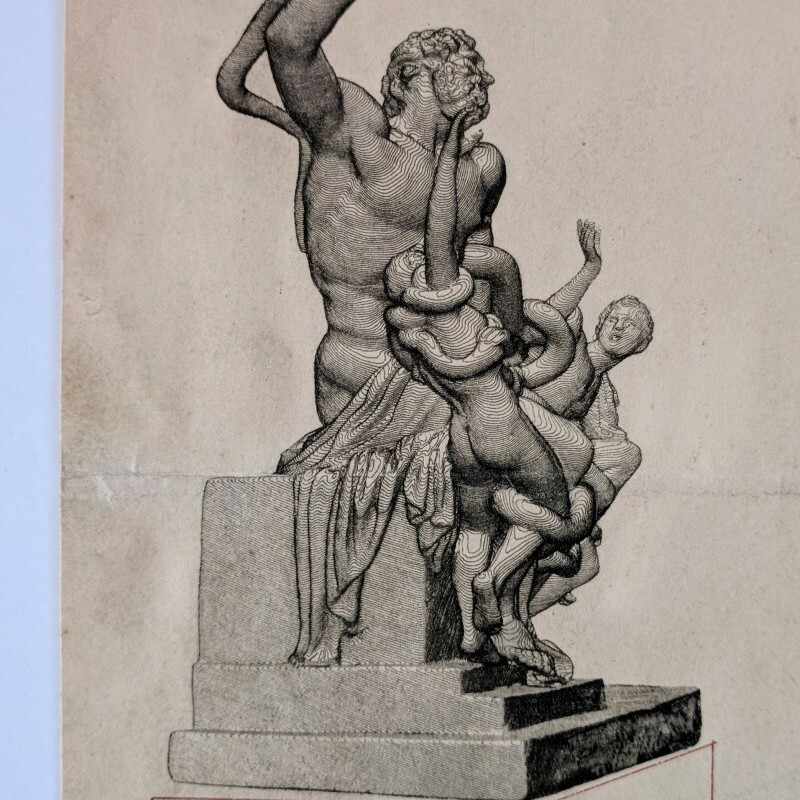 Although there seems to be little discussion of the Stokes machine after 1850 (excepting the Encylopaedia Brittanica reference), a plaster cast of the Laocoön was included in the Crystal Palace sculpture court in 1851. It is possible, therefore, that this picture depicts a Stokes machine at the Great Exhibition. The section of the work depicting the Laocoön may be printed, meaning this drawing may incorporate a print made by the Stokes machine. We are unable to confirm a single extant example of a Stokes engraving; though it is entirely possible that such a print would be miscatalogued as an anaglyptograph. Why didn’t a machine capable of accurately—i.e. mechanically—reproducing three-dimensional objects in two-dimensions catch on? Undoubtedly, the nascent technology of photography, also on display at the Great Exhibition, had something to do with it. See “On the Applications of Science to the Fine and Useful Arts: Machine for Engraving from the Statute,” Art Journal (December 1848): pp. 363-364; “Stokes Engraving Machine,” Literary Gazette and Journal of the Belles Lettres, Arts, Sciences, No. 1659 (November 4, 1848), p. 731; and The Encyclopaedia Brittanica, 8th Edition (1855), Vol. 8: p. 810.